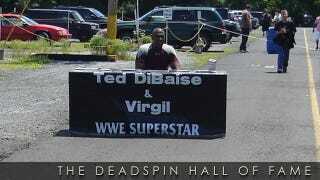 2012 Deadspin Hall Of Fame Nominee: Virgil, Pro Wrestling's Saddest Retired "Superstar"
It all began when we stumbled upon Lonely Virgil, after which we learned that many of you had your own Virgil story to share. In time, those stories also included run-ins with other has-been ex-pro wrestlers. And soon enough, Virgil learned that the Virgilbag was a thing. But then, just as quickly as it all began, the Virgilbag was no more. It was fun while it lasted, but do you think Virgil deserves a place in the Deadspin Hall of Fame? You have until 11:59 p.m. (EST) Sunday night to cast your vote. Just remember, Virgil needs 75 percent of the vote to get inducted. &amp;lt;a href="&amp;lt;a href=" http:="" polldaddy.com="" poll="" 6807006="" "=""&amp;gt;Is"&amp;gt;"&amp;gt;Is&amp;lt;/a&amp;gt; Virgil a Deadspin Hall of Famer?